Home Local News THROWBACK: The Rise And fall Of The Notorious Chief Nwiboko Obodo. THROWBACK: The Rise And fall Of The Notorious Chief Nwiboko Obodo. Isieke, in the colonial days, was a village located eight kilometers off the Abakaliki Enugu road at an area popularly called Mile 7. It was a simple rural and agrarian community where communal love reigns. However, all these changed sometime in the early 1951 when a son of the soil, who had sojourned in other lands, Chief Nwiboko Obodo, returned home to live with his people, he’s seen here extreme left of this 1958 image below. He was welcomed by everyone in the spirit of the communal bond that binded the people together. Around 1953, elders in the community started to notice the disappearance of their people. Able bodied men would go to the farm in the morning, never to return. Women would wake up early in the morning to fetch water from the stream and suddenly disappear. By 1954, over a 100 people had disappeared. Meanwhile, as the people disappeared, a set of wealthy people, under the leadership of Chief Obodo emerged in the community. This newly rich flaunted their wealth to no end, which attracted others to the group. Before long, the group had metamorphosed into a secret cult, and Chief Obodo was the high priest. By this time, the group, that was only interested in flaunting their wealth, turned into another thing. They became dreaded and untouchable. In Isieke in those days, all houses were built with mud and thatched; except Chief Obodo house that was roofed with zinc. The group, named Odozi Obodo, became a terror unto the people, even as the villagers and other communities nearby became paranoid with fear. Because of their wealth, their leadership courted and became friends to the police. They were friends to politicians and colonial officers. To buttress their power, Chief Obodo usually paid the tax of every taxable adult in the community to the colonial government. He would now turn around to tax the people as he deemed fit. Failure to pay the taxes usually led to the confiscation of properties such as farmlands, houses, cows and goats. He engineered the visit of government officials to his residence at Isieke, and every of such visits further boosted his image. After conquering Isieke, he turned his attention to Abakaliki, the divisional headquarters where he was able to raise more disciples into the cult. He also introduced a chain of command in the cult. The second in command was Nwegede Ogbo, who usually sat at his right hand. He was the society law enforcer who made sure that all sentences passed by the chief were carried out to the letter. For instance, stealing was punishable by death. Those who committed adultery were strangled with a bicycle chain. Insubordination to the chief attracted a fine, caning, or working in the chief farm. Ogbo as the enforcer supervised all death sentences whose victims were always buried in heaps at the back of his house. Such bodies were often dismembered so that they wonâ€™t come back to life. Several complaints had gone to the police, but due to the society influence, they were not investigated. A young Isieke man had attempted to report the atrocities of the chief at the Divisional Police Headquarters in Abakaliki. Chief Obodo informants in the police informed him and the young man was hacked to death. However, the end came for the chief at the height of his power. In September 1957, one of his 33 wives, and the one closest to him, Nwagbo, was accused of using witchcraft to kill his first son, Sunday. The woman pleaded her innocence, but the chief consulted his medicine men, who confirmed the accusation. The chief personally killed the alleged errant woman, using a bicycle chain to strangle her to death. She was later buried in a yam mound behind Ogbo house. 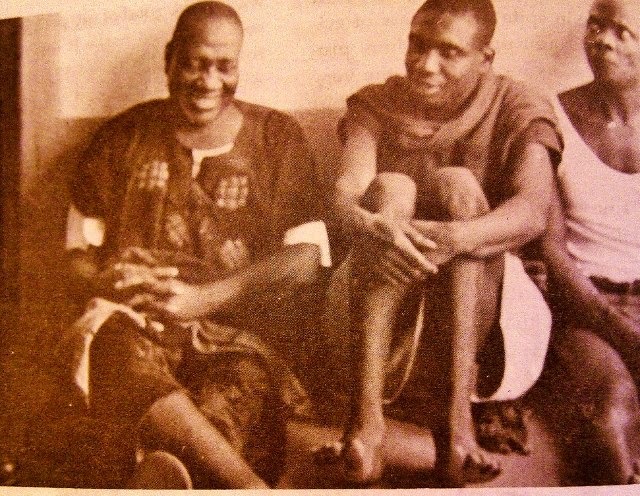 Somehow, the story of her death leaked to Nwagbo family, and her brother, Ikeagu Obajei summoned courage in January 1958 to ask Chief Obodo the whereabout of his sister, who he claimed to have been seen last in August 1957. The chief threatened the brother never to ask him such questions again. Obajei, however, would not let go. He went to Abakaliki to report to the police that his sister was missing. He did not stop there. He also reported the case at the regional headquarters in Enugu. The police promptly swung into action. They began investigations in 1958. First, there was massive transfer of policemen from Abakaliki division. Secondly, several detectives were brought in from the Central CID in Lagos. The authorities further planted two detectives as herbalists into Chief Obodo cult. The policemen-turned herbalists did their job so well that the cult members, including the chief, never suspected them. One of them posed as the herbalist while the other was his attendant. They prepared charms for the chief which worked. Chief Obodo now trusted them completely. He confessed to them that he killed his wife and asked them to prepare a charm for him that would not make his prosecution possible. The herbalists recorded his confession unknown to him. The confession was then sealed with a dried cow skin which they asked the chief to always hang on his neck. They told him that as long as the charm remained on him, he would never be prosecuted. The herbalists left after their assignment. Arresting a powerful man like Chief Obodo was not an easy task. The police had to lure him out of Isieke to effect his arrest. The police devised a means. They sent to him a summons to appear before the Abakaliki Chief Magistrate Court to answer to charges of stealing a cow from one of the villagers. The chief was furious as he considered the stealing charge as an insult. He sent his goons to arrest the offending farmer, but they could not find him. He was already under police protection in Enugu. Chief Obodo appeared before the Magistrate Court on May 23, 1958. He came to court in his chauffer-driven Chevrolet car, a rarity in those days. When his case was called, the police prosecutor informed the court that there were more serious charges against the chief. He, therefore, asked for an adjournment to enable him amend the charge. The magistrate granted the adjournment. As the case was going on, gun-wielding policemen in four lorries had surrounded the court premises. As Chief Obodo walked out of court majestically and moved towards his Chevrolet car, he was arrested by the police. He was taken in a land rover jeep into his house where the police conducted a search. The police recovered blood-stained swords and machetes, charms, bicycle chains, and other instruments that were tendered in court during his trial. Chief Obodo and six of his cult members appeared before the Abakaliki Chief Magistrate Court in May 21, 1958 in a preliminary inquiry into the murder of Nwagbo, his wife. On May 30, the court ruled that Chief Nbodo and his co travelers had a case to answer. On June 3, 1958, the case was transferred to Abakaliki Special Azzizes where their trial began. On August 12, 1958, one of the witnesses, a farmer named Aguta Nwode, testified on how Chief Obodo killed his wife with an iron rod after accusing her of using witchcraft to kill Sunday. It was in the presence of the other people standing trial with him. He testified further that the chief ordered that the body should be buried in the compound of Ogbo, the enforcer. Nwode further stated that another person accused for the death of Sunday, Nwabonyi Nwoyefu, was sworn to secrecy by the chief and other cult members. He said that during the burial, the chief directed them that they should remove the bangles on Nwagbo wrist, which they were not able to remove. The chief himself smashed the bangles into pieces, he said. Chief Obodo fellow accused were put inside the box one after the other. They all admitted taking part in the killing of Nwagbo, but that they were under supreme orders of Chief Obodo, an order if they refused, would have led to the termination of their own lives. On August 16, 1958, Chief Obodo in his evidence denied killing his wife, claiming that she had packed out of his house before his son, Sunday died. He said that he did not look for his wife when she was missing because she was an adult and that he did not suspect that any evil could befall her. However, the prosecution presented the talisman he wore on his neck and retrieved his recorded statement as evidence before the assizes. On August 18, 1958, the Special Assizes sentenced Chief Obodo, Nwegede Ogbo, Mbeke Awam, Nwagbala Nwankwo, and Nwabonyi Nwagbo, to death for the killing of his wife. The people of Abakaliki division did not believe that Obodo would die despite the sentence. They believed he had supernatural powers that would save him. Because of this, selected members of Isieke, and the surrounding communities were invited to witness the hanging of the convicts, which was done in the morning of February 24, 1959. Members of the cult were soon fished out by the communities, even as far as Idoma. More than 100 cult members were arrested and tried for several murders in the society. Those who escaped justice in Abakaliki were arrested and tried before Makurdi High Court and were sentenced to death. On February 10, 1959, the Federal Supreme Court sitting in Jos confirmed the sentences of 59 members of the society and they were subsequently hanged. This signalled the sad end of the Odozi Obodo secret society.